Cycle and Soak to eliminate runoff and conserve Water. Four (4) completely independent programs with five (5) start times, for a total of 20 possible start times per day. Watering time (s) for each station can be set from 1 minute to 9 hrs 59 mins in 1 minute increments. Quick Stations allow for rapid programming of a block of stations with the same watering time. Water Days for each program may be based on seven day week or a skip-by-day routine allowing a program to skip from 1 to 30 days between watering. Programmable rain shut down allows the selection of the number of days the controller will stay off (in rain shut down mode) before it goes back into the automatic mode. A "real time" clock holds the actual time during power outages without batteries. This eliminates the need to reset the clock every time the power goes out. No batteries to replace, ever. The Review feature brings all the information for a given program (s) to the displays with simple push of the Review Button. Multiple displays provide a truly simple way of programming and information recall. Manually activated system check/syringe cycle to sequentially run stations for a user selectable time from 1 minute to 9 minutes. Manually activated program cycle to run a program independent of its programmed start time and water days. Manually activated station cycle to run a single station for a selected time. Built-in remote control jack for use with Rain Master Remotes. Automatic field wire fault detection enables the controller to sense a short in the field wire and instantly turn off that station, report the fault and move to the next programmed station. No fuses or reset button to be concerned with. Rain Switch (auto-off) turns off all stations without disturbing the program (s). Available for 120VAC, 50/60 HZ or 220/240 VAC 50/60 HZ power. Heavy duty 18-gauge jet coat, powder coated steel enclosure for outdoor or indoor use. Two convenient sized enclosures for easy installation of field wires. Extra heavy duty lightning and surge protected models available for areas where lightning is a concern. Outdoor pedestal mount available for all models. Percentage key allows the user to increase or decrease all station run times on a percentage basis in 1% increments from 0% to 300% by program. Comes with a limited 5 year warranty. Stainless steel, expanded size field wiring cabinet. Programmable Master Valve/Pump allows the Master Valve or Pump to go on by program. Programmable stacking or no stacking of programs selects programs to run one after the other (Stack Mode) or at the same time (No Stack Mode). Programmable timer delay between stations establishes a time delay from 1 second to 256 seconds (4 minutes 16 seconds) to allow slow-closing valves to completely shut off. Programmable security code allows entry of a 1 - 4 digit number as a security code to prevent access by unauthorized personnel. Programmable sensor to enable or disable sensor operation for each program. 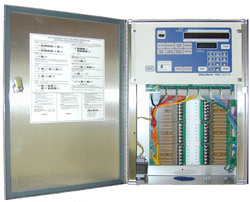 Programmable alarm to either enable or disable an audible alarm in the event of a field wire fault.